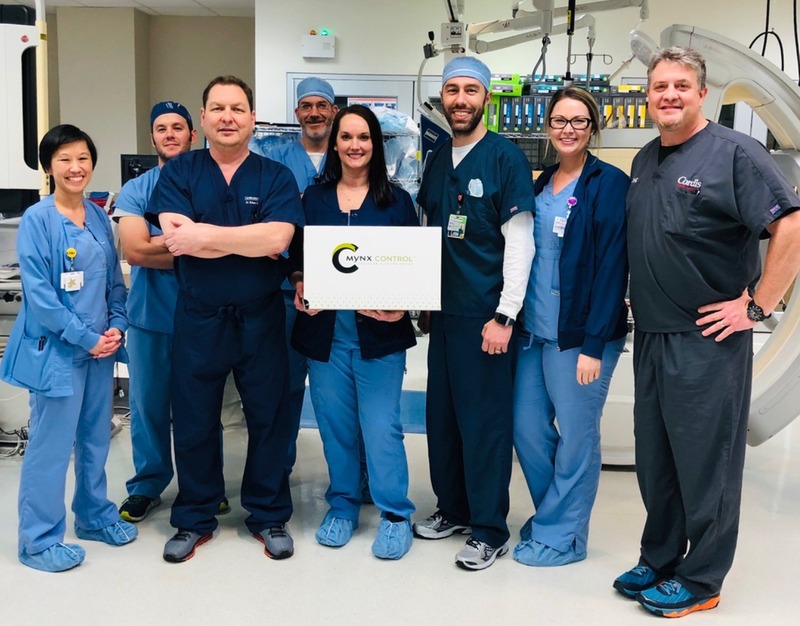 Pictured from left to right are: Theresa Kaiser, RT; Jason Vidrine, RN; Dr. Robert Menuet; Chad Thompson, RN; Elizabeth Borne, RT; Nick Trahan, RN; Chelsie Ledoux, RT and Bart Fontenot, Cordis Rep.
OPELOUSAS- On Thursday, February 24, Dr. Robert Menuet, interventional cardiologist at Cardiovascular Institute of the South (CIS), and the Opelousas General Health System cath lab team were the first in the country to use the latest version of the Mynx closure device. The MYNX® product family utilizes the proprietary GRIP™ sealant to seal the artery opening. The GRIP™ sealant, comprised of polyethylene glycol, grips the artery, providing a secure close. The sealant dissolves within 30 days, leaving nothing permanently behind but a healed artery.